Summertime and ice cream just go hand in hand, though some people will tell you that ice cream is pretty much perfect any time of the year. 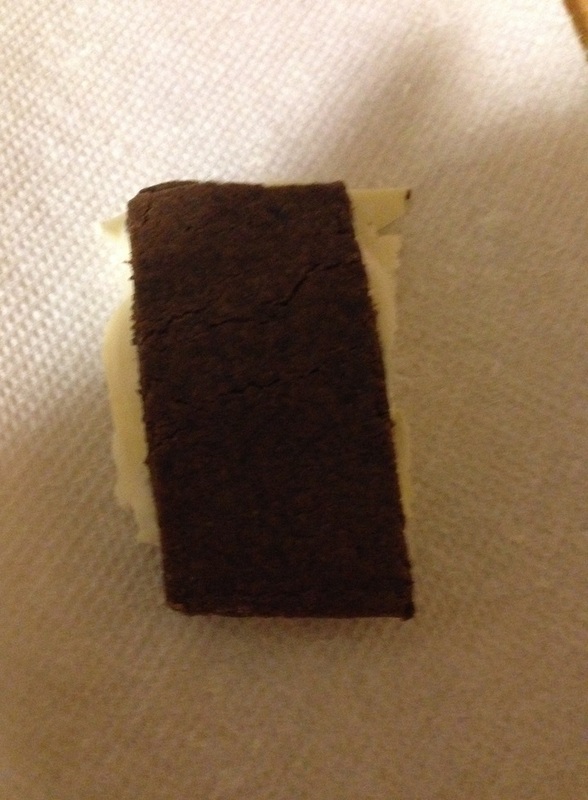 I am not a huge ice cream eater myself but I do appreciate it every now and then and Michelle and Sean both love it, so I decided to make a simple and easy treat of some homemade ice cream sandwiches. The recipe is from Bon Appetit and when I first saw the picture of their finished product and how easy it was to make these I knew I would have to give it a try. They take a little time, but if you start them in the morning you can have your own ice cream sandwiches for dessert that same night. Whisk the flour, cocoa powder, baking soda and kosher salt together in a medium bowl. Using an electric mixer, beat the butter, sugar and corn syrup together in another medium bowl until the mixture is light and fluffy, about 3 minutes. Add the egg yolk and vanilla and beat until they are well combined. Reduce the mixer speed to low and add the dry ingredients; mix the ingredients until they are just combined. Mix in the sour cream. Form the dough into a 3/4-inch square and wrap it tightly with plastic wrap. Chill the dough in the refrigerator until it is firm, about 2 to 3 hours. Preheat the oven to 350 degrees. Roll out the dough between 2 sheets of parchment paper to about 1/8-inch thickness. Transfer the dough (still between the sheets of parchment paper) to a large baking sheet and chill the dough again in the refrigerator until it is firm, at least for about 30 minutes. Remove the top sheet of the parchment paper. If the dough is well chilled the top sheet will remove very easily. Trim the dough into a 14-inch by 10-inch rectangle. Bake the dough until it is dry and just set at the edges, about 8 to 10 minutes. Transfer the baking sheet to a wire rack and let the dough cool completely. Trim the cookie to a 12-inch by 9-inch rectangle, then cut the cookie into twelve 3-inch squares. Scoop some ice cream into a medium bowl and mix it until it is just softened, about 2 to 3 minutes. Turn 6 cookies bottom side up. Dividing the ice cream evenly, scoop the ice cream on top of the cookie and press down on it lightly. top the ice cream with the remaining cookies, pressing down gently. Place the ice cream sandwiches on a parchment paper-lined baking sheet and freeze them until they are firm, at least 4 hours. Cut the sandwiches in half diagonally to make triangles, if you wish. Wrap the sandwiches in parchment, if desired, and freeze them until you are ready to serve them. They are very easy to make and I can tell you that the dough smells and tastes just like what you get if you bought an ice cream sandwich from a store or the ice cream man. The best part is that you can make them with any type of ice cream that you like, so you can really vary them to suit your particular liking or your family’s and make them in different flavors if you wish. I cut them small to make smaller sandwiches, just he right bite-size snack that we could all enjoy. Of course you could always make them completely homemade and make your own ice cream to put inside them, but any of your favorite flavors work just as well.They are very easy to make and worth the wait, so I would certainly make these again.